So lately, there’s been all this hype over this “RFR5K” thing. If you don’t know what that is (like me, who Googled it specifically for this post), it stands for ‘Red Face Runners’ and it’s, obviously, a 5K run. Aka, the antithesis of my being. I am not a runner. Never have been*, never will be. *Okay, so this ONE time, I decided I was going to be a runner. Everything was going swimmingly with the whole planning production of becoming said runner. I thought about running all the time, I became inspired by runners, I briefly looked into treadmill purchases, and I spent $15 hard-earned dollars on a pair of Payless running shoes. And then I actually ran–or more like hobbled down the street clutching my chest in pain (“is it supposed to BURN LIKE THIS? !”) before realizing that I am not actually a runner, never will be a runner, and much prefer to never pretend to be a runner than pretend to be a runner again. Get it? Good. Also lately: I’m having trouble with my pants wanting to, ya know, be worn. I want to blame Mother Nature for causing me to wake up sweating from the FREAKINGAWFUL 100+ degree days we’ve been having, and curse sweat for making my legs too sticky to pull my pants off, but if we’re being honest, there are some cookie lovinz hanging out on my thighs that *could* stand to be put to work instead of being freeloaders. So I’ve decided to work out. 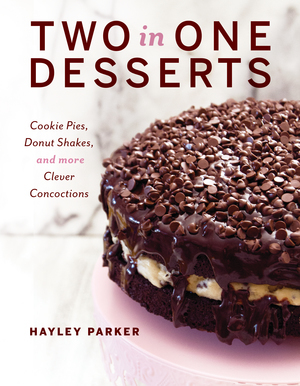 It’s not my choice; but rather, it’s a measure I’m taking to give those frosting-huggin’, freeloader thighs of mine a run for their money. Or, er, a jog. I’m certainly not built to train like my pals who are actually running this RFR5K race, but rather, I’m doing it to lose the muffin top. You can only blame Mother Nature for so much, ya know? Hurricanes, droughts, tsunamis… but definitely not muffin tops (damn). At this rate, I’ll have a slammin’ bikini body to cover with thick-knit sweaters and boots by October. 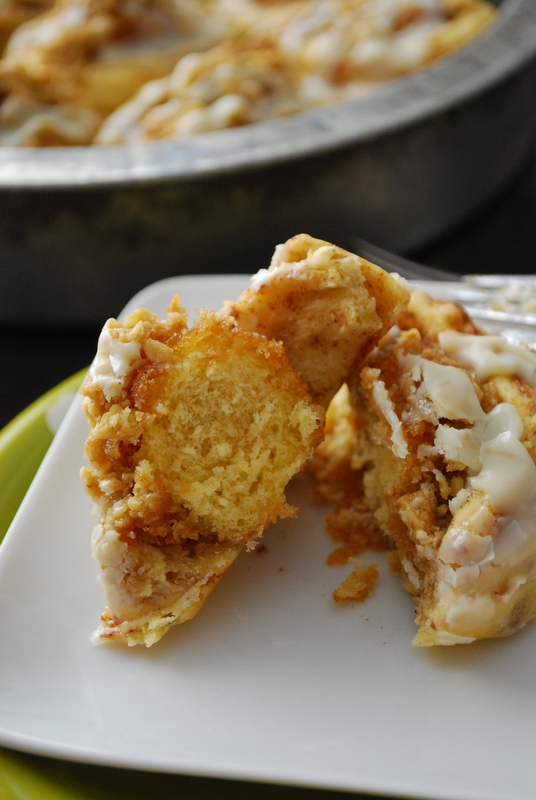 Also, I’m doing it so I can eat even more of yummy things like these Doughnut-Stuffed Cinnamon Rolls. They pretty much top the cinnamon roll hierarchy because they’re unrelentingly sweet, dangerously delicious and freakin’ stunning. They’re like Duchess Kate, if she were a marvelous little cinnamon roll. 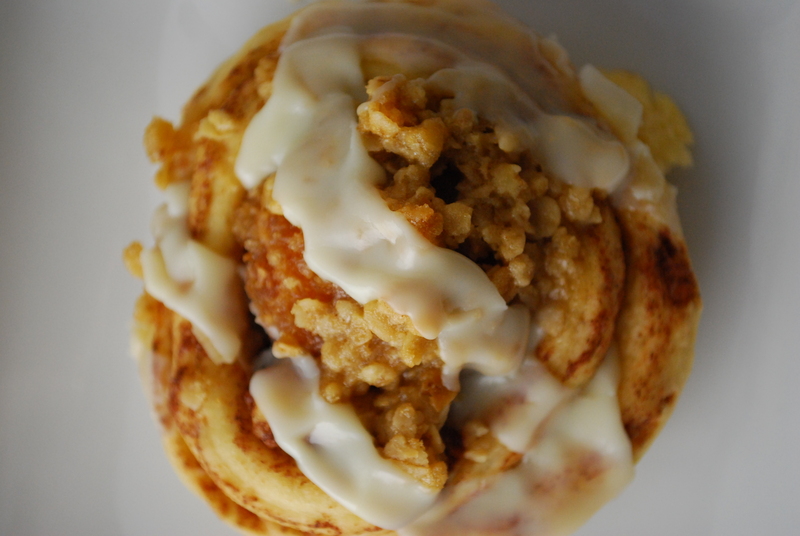 It’s normal to want to be BFF’s with this cinnamon roll, it’s that good, people. Here’s the chow down: a perfectly good cinnamon roll gets upgraded with a crumb donut hole rolled into the middle, then is topped with a really good brown sugar streusel, is baked until golden, and is drizzled with icing. The result is kryptonite to your workout, but the BFF to your life. And honestly, you wouldn’t turn your back on your BFF, now would you? 1. 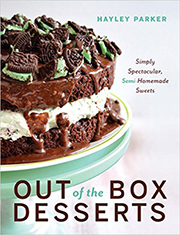 Preheat oven to 350 degrees F. Liberally grease a 9″ round cake pan with cooking spray. 2. In a medium bowl, mash together the butter, brown sugar, cinnamon, flour and oats with a fork until a soft streusel-y paste forms. Mixture will be more wet than crumbly; that’s normal. Set aside. 3. On a clean, flat work space, gently unravel each cinnamon roll. Place a donut hole in the center and reroll the cinnamon roll. Place each cinnamon roll in the prepared pan, spacing them evenly. Top with a heaping Tablespoon or two of streusel topping. 4. Bake for approx. 10-12 minutes or until lightly golden. Drizzle hot rolls with reserved icing and serve warm or at room temperature. Store leftover rolls covered, at room temperature, up to 1 day. One word sums these up: Amazeballs. Seriously, y’all, you need to make yourself a batch of these and then give yourself a giant bear hug for being an awesome BFF to yourself and your tummy. Thanks, and have a wonderful Monday!! It’s impossible not to drool all over when looking at your food!! My thighs add circumference just looking at the picture! I hear you about running, blah. I WANT to run, I just can’t. I’ve tried it in the past. Now I’m too timid to try again. I fear someone will laugh at me huffing and puffing for sure. Good thing about having a small dog is they prefer walks!!! Which I will need after checking out your cinnamon roll! I am also not a runner. My rule of thumb is that I will only run if something large, terrifying and hungry is chasing me. That said, I too tried running (for a microsecond) to lose my muffin top (or as I like to call it, my ‘Grinch Belly’) which my kids so very lovingly gave me as thanks for housing their persons for 9 months each. Unfortunately, ‘running + me = jiggly bits in motion’ so my foray into running was short lived. I will say that i do walk quite a bit and that pace suits me and all my bits better. Good on ya for getting out there so you can have a rocking’ muffin top-free body in time for …. Thanksgiving. ;). You are doing better than I. :). 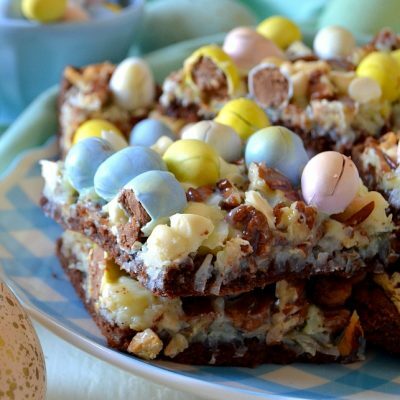 A wonderfully sinful recipe. Thanks! Laurie, I agree! I much prefer walking. My dog and I love walking every day, and usually try to do it 2-3 times a day, depending on weather and such. It’s much nicer and still awesome exercise! I wish I wanted to be a runner. I know it’s great for the figure. But first of all, I hate running. Second, I’ve heard it destroys your knees. I just can’t get into it. But I can get into these cinnamon rolls. Deliciousness! OMG, it does?! Makes sense. I knew it was evil. We must protest it! Wow. These are pretty much genius! If it ever cools off we can do a slight jog on our walk. 🙂 Seriously, 108 again today? I might die. So you better bring me a cinnamon roll. Isn’t it ironic that your perfect bikini bod will be ready in October…when it starts getting cooler outside and you’ll want to cover up in jeans and a sweater? Think of it this way, you’re slimming down so you won’t feel guilty about all those Holiday calories. 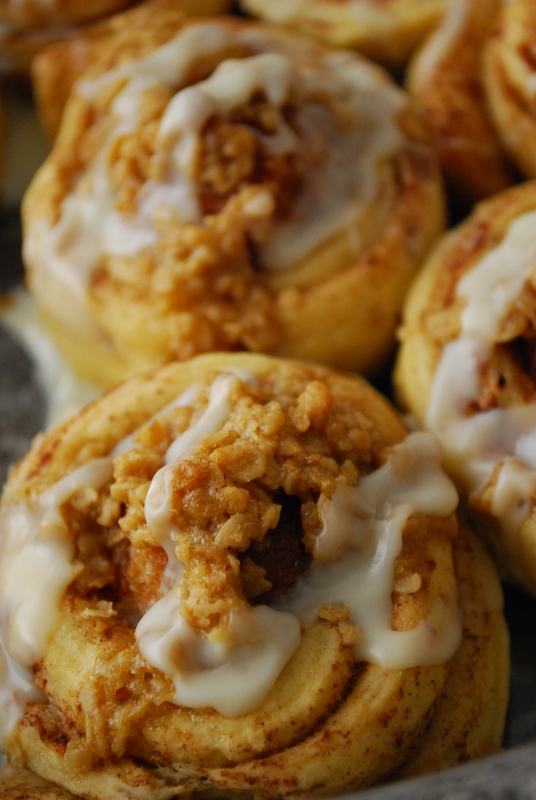 Meanwhile, these cinnamon rolls look delicious! Bibi, that’s exactly how I feel! Glad I have some backup here! Most of my friends run and I can barely keep up! I don’t run. EVER. It hurts my knees and makes me sweaty and my chest burn. Why would I put myself through that torture? Gah. Walking, fine. Pilates or Zumba, fine. Running? Big.fat.NO. 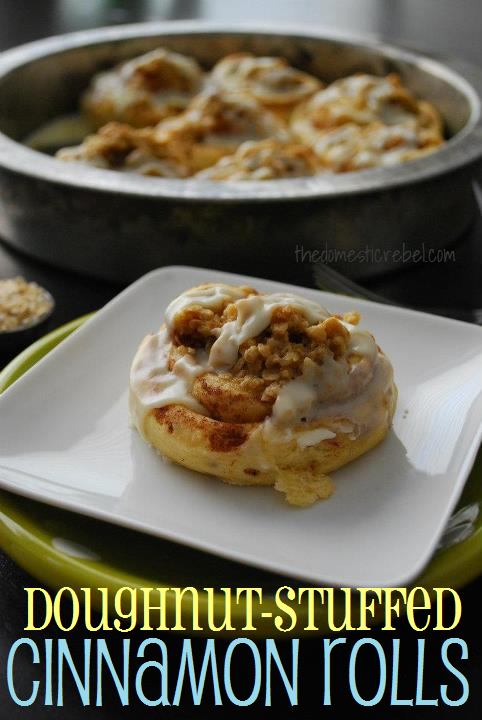 But I would eat one of these donut stuffed cinnamon rolls. Okay, two. And think about my swimsuit next summer. Man, I wish we could do Zumba together! That’d be so fun. And yes, swimsuits are SO next summer. Time for boots, washboard abs and donut-stuffed cinnamon rolls. This is so delicious! Donuts and cinnamon rolls! You could market this to quite a few well known companies. A great combination of sweets! My pants feel for you, haha. Luckily, I just had my wisdom teeth out and after 6 days of a mostly liquid diet, they’re back to fitting around my hips. 🙂 Although, thanks to you, that won’t last long! Your cinnamon roll is amazing! Donut inside, genius!!! I’m with you on the running. I always hated it too! Like with a passion. I tried a few times and it was death on a stick! But last year, New Years came around and I thought I’d give it one last try, do our city’s iconic race, and mark it off my bucket list, permanently retiring my sneakers. But I found a plan that worked for me and now I love it – I know I can hardly recognise myself =p If you’re up for trying again (and no pressure at all), I can totally recommend the couch to 5k program (they’ve got a bunch of great phone apps to make it even easier). And btw turns out recent research has refuted the whole “bad for your knees” thing. It actually has a protective effect if you build up slowly. Hey Jessi, that’s good to know! And congrats for completing a race–that’s awesome! I really want to do a mud run one of these days (they sound so fun!) and I’ve heard awesome things about that couch to 5k app, so perhaps I’ll look into it. Thank you! Ohhh a mud run. I’ve always wanted to do one of those. My sister did one and she had such a blast! I’m sure you could do it!!! I can’t say enough good things about couch to 5k. Seriously I NEVER thought I would run, and I certainly NEVER EVER thought I’d run and like it. That’s SO inspiring to hear! I really want to get into some kind of sport–maybe not running necessarily, but zumba or something. It sounds so fun! bwahahahaha. your story reminds me of the two seasons i was going to make it as a field hockey player. the two seasons that i spent doubled over on the side of the field trying to to hurl in front of my teammates, who were far better at physical endurance than i. Hey Emily! Ugh, sports! That reminds me of the one time I decided to participate in one of my dad’s wrestling practices. It made P90X look like a walk in the park… with an ice cream cone… and puppies. Ewwww. Anyway, let’s not talk about exercise but rather, partying and cinnamon rolls. Thank you! I’ll check it out!! Trying these as a request from my daughter for her birthday breakfast! What kind of cinnamon rolls did you use that unroll? Thanks in advance! Hi Kristina, the refrigerated cinnamon rolls are perfect (like those by Pillsbury). I’m sure your daughter will LOVE these!! Thanks for stopping by!